A single high-powered rechargeable light is by itself adequate for most people. More lights can be beneficial (although too many are counterproductive), but if you choose one of the lights suggested below you'll be in good hands. 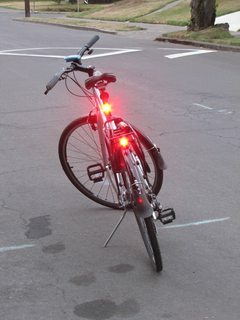 According to some safety research users on the Bicycles Stack Exchange site found when pondering whether flashing or steady lights are safer, a flashing light catches your attention faster, but a steady-burn light is easier to judge distance by. If you have room in your budget for two lights, it's a good idea to set up one on steady-burn and another on flashing mode, and physically separate them by at least 1 foot so that they don't just look like a pulsating steady light from a distance. Putting the Cygolite Hotshot on your rack or stay and the NiteRider Solas on your seatpost is a perfect combo. The Solas has better side-visibility, and on the seat post it can be better seen by traffic on your sides. In flashing mode the Solas serves as the attention-grabber and the Hotshot - which has better straight-on, long-distance brightness - is on steady burn. The Solas + Hotshot combo would run you about $65, and is probably the best two-light deal you'll find, but any of the other rechargeable lights would work well in this application, too. If you really want to make a statement with your lights, take the "balanced setup" and add a second steady-burn light. Having two steady burn lights at the same height, separated by as much distance as you can put between them, makes it much easier to judge how far away your bike is. The closer your bike is, the farther apart the lights appear in drivers' vision. 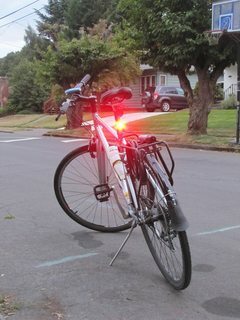 You could mount one light on each side of your bike (either on the sides of the rack or on the seat stays) in steady burn, and then mount a third light on the seat post in flashing mode. If you already have a non-rechargeable light that works ok but you're looking to upgrade, you could also buy 2 new lights, stick one on each side of your bike as recommended above, and then put the old light on the seat post in flashing mode. 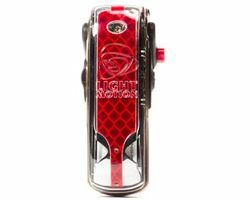 You'll want to have the rechargeable light for the steady burn, since steady burn runs through batteries faster. Check out the FAQ for more info on flashing vs. steady lights, what lumens and other units mean, and specific taillight recommendations for aero seatposts. Brightest light under $60: The Serfas TL-60 "Shield"
The winner of the original lights review that started the Bike Light Database, the Cygolite Hotshot continues to impress to this day. With a built-in USB rechargeable battery with over 4 hours of life on its brightest steady-burn setting, and over a 100 hours on flashing mode, the Hotshot will get you through any ride. On the highest setting it's bright enough to be seen from a mile away, but the brightness and flash speed can be adjusted on the fly to fit the conditions for each ride. The Hotshot comes with redesigned mounts that securely attach it to your seat post or stay, and you can optionally buy a rack mount that makes it perfect for setting up in a dual configuration with another light on your seat post. No other light matches the build quality, battery life, output, and features of the Hotshot for this price. And, if you're looking for something slightly less spendy, the newer Hotshot SL has all the same features for $10 cheaper MSRP. The SL doesn't come with a stay mount and has 2 fewer flash patterns, but has identical battery life, brightness, and configurability. The Hotshot is available in a combo pack with the Cygolite Metro 400 (MSRP $85, typically about $70 on Amazon), and the Hotshot SL is available in a combo pack with the Streak 310 (MSRP $75, typically about $60 on Amazon). 2016 Update: Cygolite has recently released the Hotshot Pro 150, Hotshot 100, and Hotshot SL50. 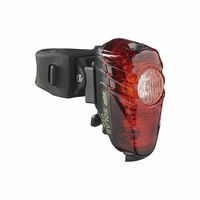 Check out our latest Hotshot review for details on these new lights. Spoiler alert: they're even better now, and absolutely still the #1 pick for taillights. The NiteRider Solas shares many of the Hotshot's desirable features: it's rechargeable, has good battery life, is bright, has a sturdy mount, and is affordable. The biggest difference is the lens: the Solas has a diffuser built into its lens that spreads the light into a wider beam. From straight-on the beam isn't quite as bright, but it's much more even when viewed from off-angles. The Solas doesn't have adjustable flash patterns like the Hotshot, but the built-in flash patterns are very attention-grabbing, and it has both a high and low steady burn option. On the highest brightness it lasts over 5 hours, the longest for any light in the 2W rechargeable class. Unfortunately no rack mount option is available, but the included seat and stay mounts are reliable and easy to install. 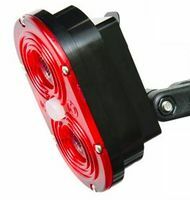 Update: As of fall 2016, NiteRider is offering a 150 lumen and a 100 lumen version of the Solas taillight. Both come with a new rubber mounting strap. I haven't had a chance to review these new lights yet, but they use the same mounting strap as the Sentinel 40 I've tested. I find the mount difficult to use – it moves around too easily and is excessively bulky. Now that the Cygolite Hotshot series has options with diffusing lenses, the Solas line is less appealing. If you need a really bright light but don't want to break the bank, look no further. The Serfas TL-60 outshines any other light under $100, and yet costs only $60. With a 60 lumen output, it's attention-grabbing even in direct daylight, and is downright excessive at night. Fortunately, it includes a low-power mode which drops the output to 35 lumens and boosts the battery life. Unfortunately, the brightness comes at the cost of battery life – the light only lasts an hour and a half on its brightest steady-burn mode. Battery life is improved in flashing and half-power mode, but it's not the perfect light for an all-day ride. Serfas recently released the TL-80. It's 25% brighter, and also offers redesigned optics that improve off-axis visibility. Battery life is also improved, lasting 1:45 on the highest steady-burn mode. The charging port brings some new frustrations, detailed in our full review, but overall it's a significant upgrade from the TL-60. The Vis 180 is by far the nicest taillight we've reviewed. It's built out of aluminum and sturdy plastic – none of that brittle stuff. It has a USB rechargeable battery that lasts over 5 hours on the highest brightness. True to its name, the beam is even and bright from wide angles, and amber side LEDs grab your attention from beyond 90°. The mount takes some getting used to (covered in more detail in our full review), but is ultimately among the most sturdy we've seen. And perhaps most importantly, it has a battery level indicator that goes from green to yellow to red as the battery drains, eliminating the charge guessing game that so many lights present. At $100 retail price, the light costs more than most would be willing to pay, but if you can afford the price you get your money's worth. The light also just got upgraded from 50 to 70 lumens for the 2014 version. If you just feel like spending a lot of money on lights, there's no denying that the DiNotte is brighter than any of the other ones here. We haven't reviewed it in person (DiNotte has denied all requests to borrow a light to review), but DiNotte has a lot of fans who swear by their products. That being said, for the cost of a single DiNotte 300R, you could get six Cygolite Hotshots, four L&M Vis 180's, or any other combination of more than enough lights. It's always a good idea to have 2 lights (even if one of them is a cheap AAA light) just in case one goes out or falls off, which makes it feel silly to spend so much on a single light. It is worth considering that both the DiNotte 300R and the Light and Motion Vis 180 are manufactured in the USA, so if you can afford the extra cost, it's nice to support the (more) local economy. But for most users whose bikes might cost less than a front and back set of DiNotte lights, these lights are probably too expensive to justify.